• Do you have some friends who wish they could visit Regale as our members do? Our Open House day is the perfect event for them. No appointment necessary, open to non-members, and to top it off The Pizza Gypsy will be serving their amazing pizzas. Tell your friends, bring your family; it’s a perfect way to start the spring season. • We offer a relief from the pain of handing your hard-earned money over to the IRS, or an excuse to spend a hearty refund! We pay the tax on any wine purchases, with additional wine specials and treats. 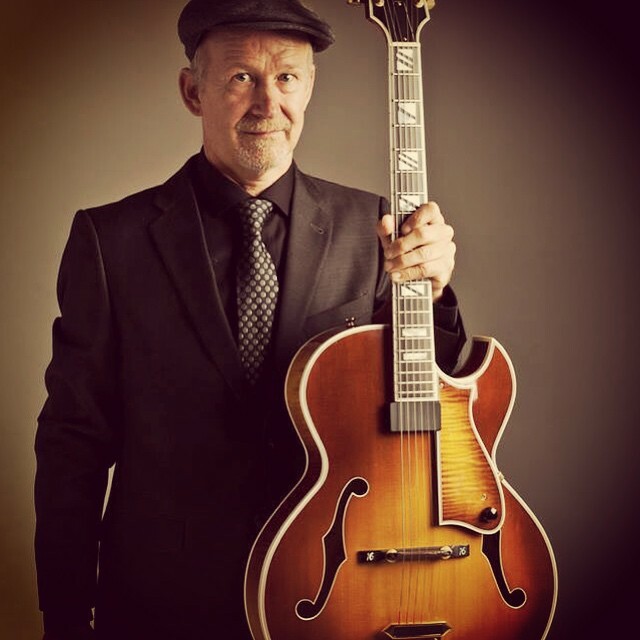 As the warm weather has arrived, we have begun hosting some talented musicians on most Sundays and will continue for the spring/summer season. To be notified as to who is entertaining for a specific weekend, please follow us on Facebook. Along with our other varied and unique corporate event add-ons, we will now be offering Champagne Sabering! 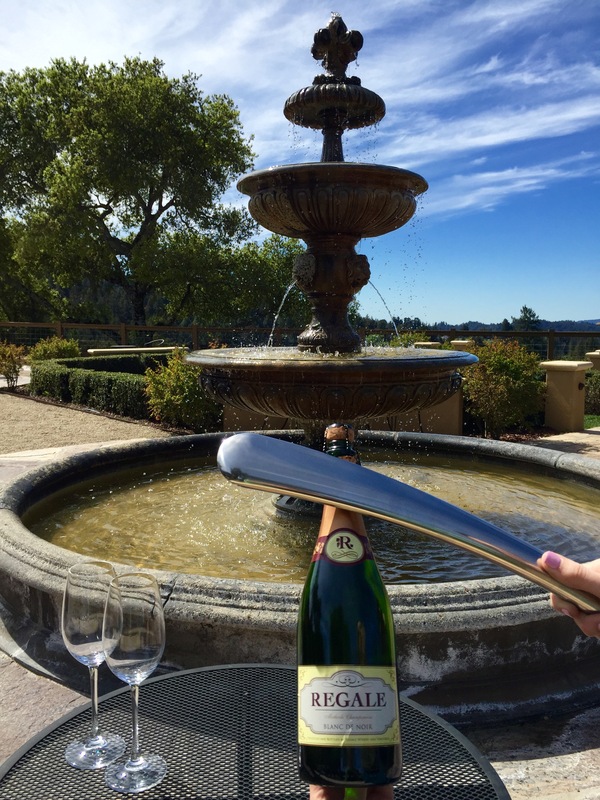 Learn a new party trick from Regale’s seasoned wine professionals – how to extravagantly open a bottle of sparkling wine using a Champagne Saber. Sabrage is a technique for opening a Champagne bottle with a saber, in our case a blunt designer version specially crafted for popping corks in style. The saber is slid along the body of the bottle to break the entire neck away from the bottle, leaving only the base of the bottle open and ready to enjoy. Your guests can watch and learn, or join in on the fun as they don safety goggles, gloves, and a brave face! Our hours have changed! We are now open to members Saturdays 11-4 and Sundays 11-5. Non-members can enjoy tastings by appointment only, make appointments online at vinovisit.com or by calling us at (408) 353-2500. If you are a club member and would like someone else to pick up your wine shipment, we need advance notice (by 3pm Friday) through the office. 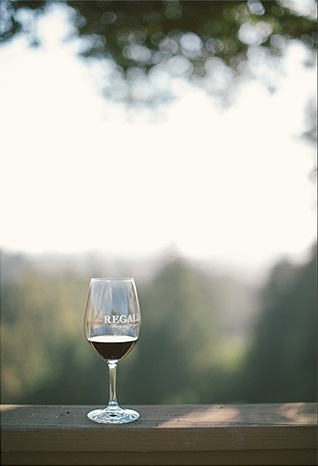 To notify us, you can call (408) 353-2500 or email wineclub@regalewine.com. 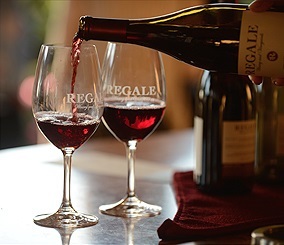 Regale is an adult-only property and no children are allowed during tasting room hours. Dogs are allowed at Regale, but please be courteous to others and keep your dog leashed. As of March 1st, Regale Winery will be transitioning to By Appointment instead of holding regular hours on the weekends where we are open to the public. (Members will NOT need to make advanced reservations.) 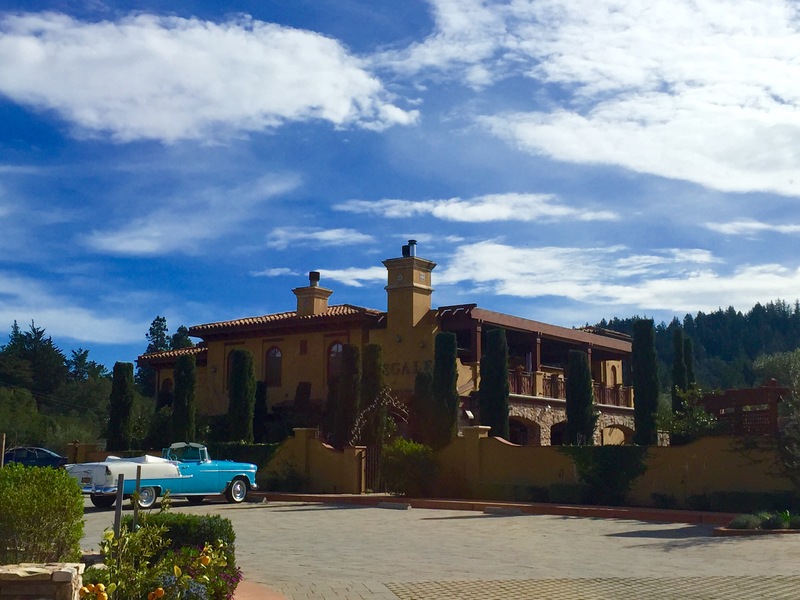 Our goal is to provide the best experience for all visitors to the winery and we believe this will allow us to have a more serene private winery experience for our club members, while also being able to fully focus on our public visitors as they learn the Regale story and experience our property and wines. Also beginning March 1st, we will begin opening earlier for our members, with updated hours from 11-4pm on Saturdays and 11-5pm Sundays. Appointments will be available on the hour for our public visitors. 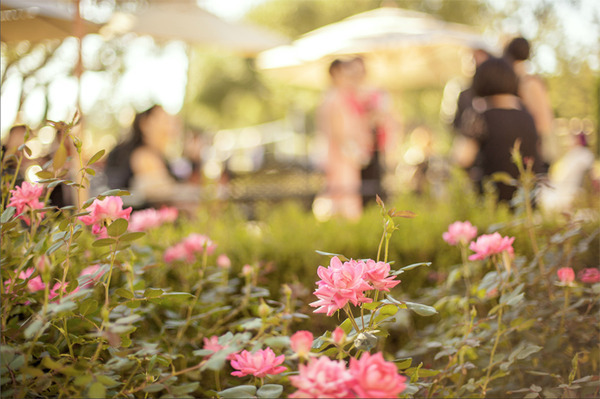 What this means for Club Members: Your experience at the winery should change very little as you will not need to make an appointment for yourself or to bring guests up to the winery on the weekends. You will have the benefit of additional attention from the staff, and a quieter experience throughout the winery. We still encourage table reservations for busy weekends or parties larger than 4-6 so we can plan for your arrival. What this means for Public Visitors: We still would love to have you visit Regale and discover what makes our wines and winery truly unique. In order to provide a more structured experience to include a tour, tasting, and personalized guide we simply ask that you make an appointment before heading up to the winery. This can be done by calling our office, or on our website at RegaleWine.com through the reservation link. There is no advance payment required, and reservations can even be made day-of if there is still availability.